What is it? 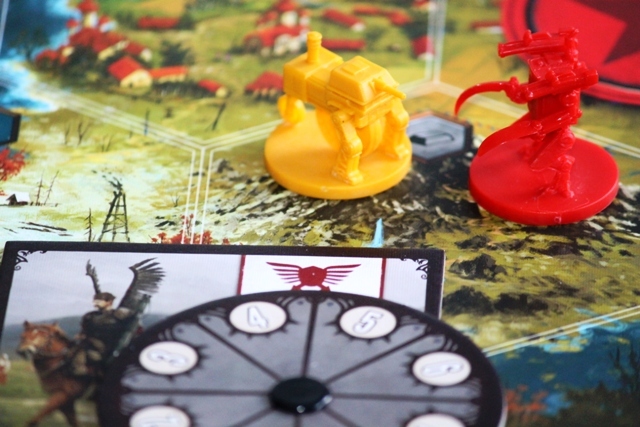 Scythe aims to innovate, not so much on a mechanical level perhaps but certainly when it comes to the complete gaming experience. 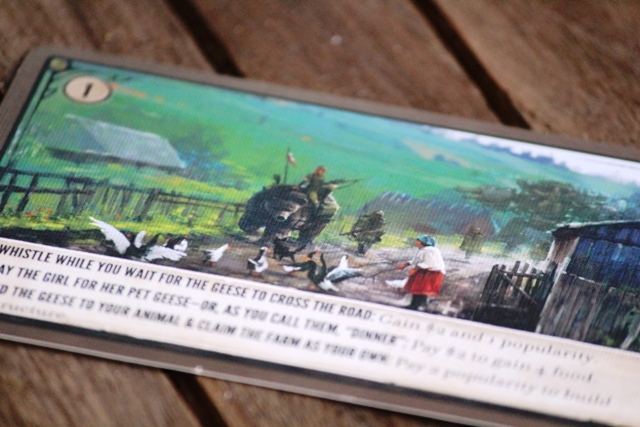 It's by no means the first hybrid design that attempts to mesh Euro-centric mechanics with a potent theme, but Stonemaier Games is hoping it will prove one of the best. The process may feel familiar, generating resources and area control and finding the most efficient way of selecting your actions, but can Jamey Stegmaier's experienced touch add enough to make the known feel like a step into something altogether novel? 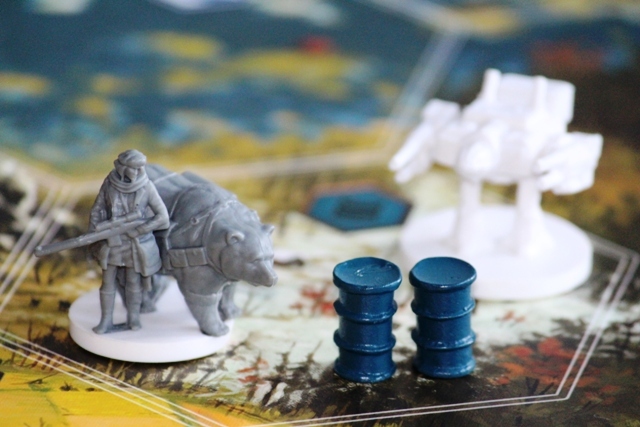 Does Scythe live up to the hype? No. Right, so hopefully that’s taken care of those asking the wrong question and expecting the wrong answers, you can exit stage left and there should be milk and cookies in the waiting room. Hype is like the Gelatinous Cube in D&D, oozing slowly along the corridors of anticipation, absorbing common sense and carrion and corpses. Nothing lives up to the hype, that’s precisely what makes it nigh omnipotent. For everyone else still reading and interested in hearing about the game itself and not some nebulous artifice, there are only two questions that really matter. Does it deliver on what it said it would? Is Scythe a good game? The answer to both, is an emphatic yes. And in giving you that answer, I’m going to attempt to finally please my 8th Grade Mathematics teacher by doing what he always so politely asked and yet I never did – I’m going to show my workings in the margin. The first question is the easiest of the two, so I’ll deal with that first. Stonemaier games promised some of the best boardgame components ever, and they delivered exactly that. There’s a reason much of Scythe’s success is built upon the work of artist Jakub Rozalski – it is quite simply, phenomenal. And it’s not just the quality that impresses, but how much of it there is in the game. 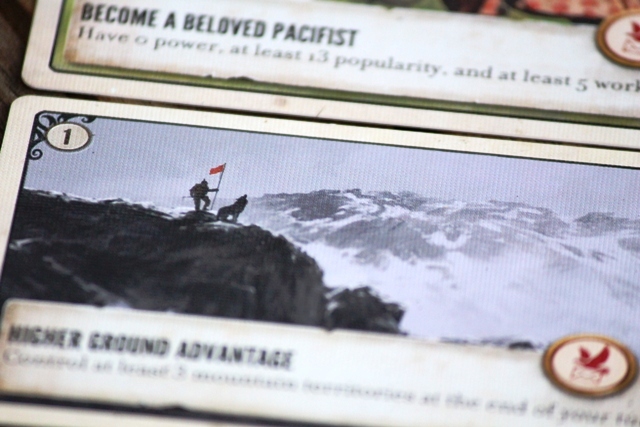 Each of the 51 objective and encounter cards are unique, as are each Factory card, each Player mat and each Faction mat. I’d be delighted to have any of those images blown up, framed and hung on my walls and it will be a while before I’ve recovered from the disappointment of not backing the Art Connoisseur level and missing out on the Artbook. Scythe could so easily have fallen into the trap of yet another Euro with a gorgeous theme that becomes sidelined after the first few plays because the mechanics take precedence, but it’s a testament to how evocative Jakub’s art is that after half a dozen games I still feel instantly transported to their alternate 1920’s Europa. I won’t lie, that board helps too, even more so when flipped and clipped to the expansion board that makes the hexes 50% bigger. The character and mech miniatures aren’t quite at the level of detail companies like CMON are churning out, but they’re sturdy and more than up for the job at hand. The fact that each faction’s mechs are a unique sculpt and not just different colours is just another indication that you are absolutely getting what you pay for. If you can, get the realistic resources tokens as well – aside from looking fantastic, it does help to be able to distinguish resource types more easily. The metal coins are also excellent, but you’ll only ever user the lower denominations during the course of the game, so unless you see a use for them in other games, they are bling you can live without. I can’t overstate enough just what a pleasant experience it is getting Scythe from the box to the table. 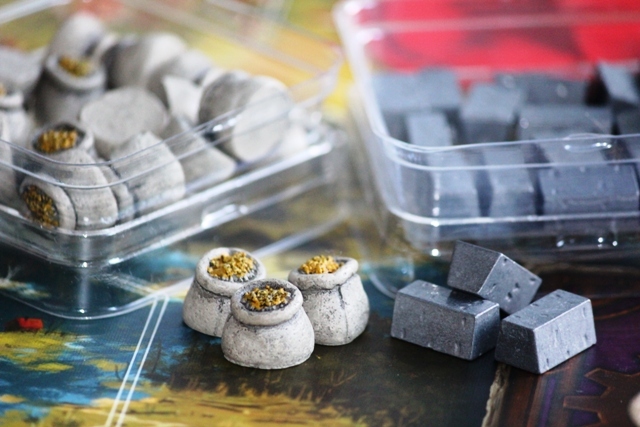 An abundance of baggies ensure everything is easy to set up and pack away, and the rulebook – after having grappled with the rules for The Others recently, just thinking about Scythe’s rulebook sets my heart aflutter. It helps that the rules complexity is far lighter than you might imagine, but the writing is clear and concise with plenty of examples and the layout is logical and easy to reference. The iconography is not really a large part of the game either, those Player mats may look somewhat imposing, but they become second nature halfway through your first game. And man, I hope duel-layered mats becomes far more popular, it’s a distinct pleasure slotting all the wooden pieces into their niches and not having to worry about components spilling everywhere whenever someone sneezes. What about game length and player counts? Stonemaier claim 1 to 5 players, and whilst you’d expect things to work well at 3 or more (and they do) it’s the smaller player counts that often don’t operate quite as well for games of this style. I’m pleased to report that Scythe is just as good at 2 as it as at 4, and that the dynamics of the game shift accordingly. I’m not averse to playing games solo by any means, and have done so with Runebound and Arkham Horror, but that’s usually more an exercise in enjoying the atmosphere and theme of a game than a desire to beat it. As Luke will no doubt be delighted to hear, Morten Pedersen and his team have matched Jamey Stegmaier’s excellence in design with their Automa variant. The movement rules do take a little getting used to, but the AI deck works beautifully and both of my solo games thus far have been engaging, suspenseful and simply a joy to experience. Coercion is a faction specific ability. It may not seem like much, but take my word for it, that ability is incredibly useful. In our experience, the advertised 115 minute play time, as unusual a number as it is, seems more accurate than we’re accustomed to. We haven’t hit under the two hour mark just yet, but experienced players will comfortably dip below that mark. And the solo game plays even quicker. The only aspect of the ‘does it play as promised’ question that has come under some debate, is whether or not Scythe is a genuine 4X game. Whilst the expand and exploit actions are absolutely in no doubt, I’ll grant that there is merit to discussing explore and exterminate more closely. 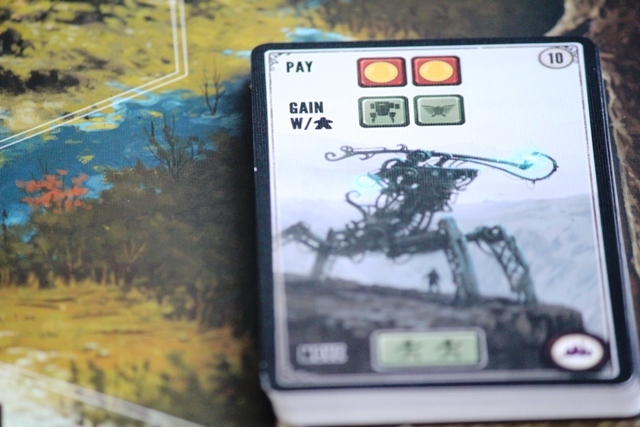 Exploring only ever grants additional bonuses via the encounter cards, which is as simple as entering a hex and claiming the explore token in it. There’s no revealing of hidden territory, no adding new hexes that may prove as much of a hindrance as a boon. As for the exterminate, I’ll discuss combat in a bit, but it’s absolutely true that one can play an entire game without a single instance of combat occurring. Let’s state it like this – you can explore and you can exterminate, whether it’s to acceptable 4X standards depends entirely on how important that term is. For me, it matters little. Scythe’s balance is masterful. Balance is always incredibly important, but even more so when dealing with asymmetry. And the combination of Faction specific abilities with player mats that subtly alter the potency of player actions just screams thorough playtesting. Player actions. The simplicity of having at most two actions to execute on a turn is ideal. Not only does it ensure that turns flow quickly in a style of game accustomed to getting bogged down by AP, it’s also incredibly friendly to newcomers. For a game that looks intimidating, it’s deceptively simple to play. The complexity is all in the mastering of the game, where it should be. Achievement stars. I adore the fact that Scythe rewards you for excelling at any of the game’s mechanics. Deploy all your Mechs? Star. Produce all your workers? Star. Complete all your upgrades? Star. Ten ways to get a star, but only six of them count. So not only does the constant sense of progression just feel gratifying, but it also makes for genuinely intriguing strategic options. Combat options for the pacifist. I love that the game affords you a degree of control over the consequences for opponents attacking you. Since the winner of combat potentially loses Popularity (essentially VP) for each worker the defeated opponent controls in the same hex, it means that players who prefer to chase victory in less militaristic ways still exert an influence of sorts. Encounter cards. As engaging and important as all the action happening on the mats in front of you is, there’s also joy to be had in traversing the map just to do encounters. Sure, they are a very simplistic ‘I pick up a card and get stuff’, but I adore the slightly dark sense of humour that accompanies each one. And again, that art is exquisite. The Factory. Central to all regions, is the mighty Factory hex. 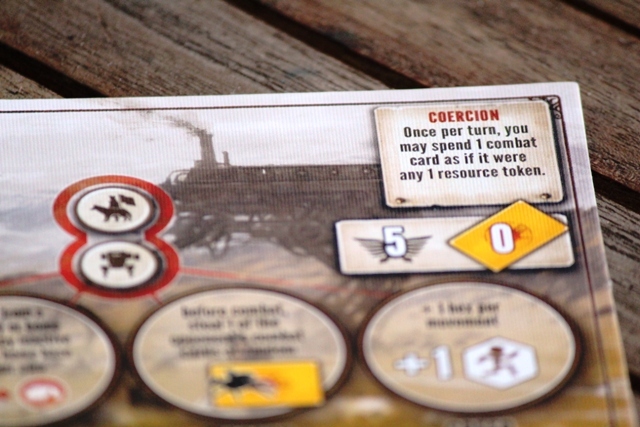 Not only does it reward the player who controls it at the end of the game, but each player who makes the journey to the Factory will be able to draw a Factory card. These are essentially an additional slot of two actions you can perform each alternate turn, and since the first player to reach it gets to choose from the available cards (number of players plus one), the race to get there first is both thrilling and tense. Everything has end game value. Coins are straight 1 coin equals 1 VP. Controlling hexes is worth points, resources are worth points. And most importantly, your position on the Popularity track informs the VP value of your achievement stars. Identify that an opponent is going to place their last star before you? Spend your final turns upping your popularity and expanding your hex control, and you can absolutely steal the victory. A Factory card – two coins to deploy a mech and gain extra Power? Yes please! Combat is deterministic. Whenever you march your character or mech into an opponents hex, it is entirely possible to be assured of the outcome without knowing what combat card your opponent will play. And since resolving combat is as simple as comparing the combat card value together with the Power each player is willing to give up, it would be fair to argue that this is certainly the weakest aspect of the game. In practice though, I’ve played games where combat does not occur at all, as well as games where together with unique player powers and a limited supply of Power to spend, the outcome has been anything but certain. Placing the sixth star ends the game. Again this is subjective by nature, but if you dislike the uncertainty that this end-game condition brings be prepared for frustration. You may have 20 turns, you may only have 15 turns and sometimes you may even have one less turn than the eventual winner. Yes, it is basically a race mechanic. Two opposing mechs, a combat power dial…it’s about to go down! On one of the encounter cards, Bjorn of the Nordic Kingdom sits astride his faithful muskox, Mox. A thick fog swirls around the oil-drills, as if the air itself were a mirror for the frost upon the ground. A soldier lights his pipe, perhaps taking a moments solace at the sight of a young boy riding a reindeer. You almost don’t notice the mech, obscured in the distance, distracted by the charming moment playing out before you. But it’s there, massive canon like an accusatory finger directed at the heavens. It’s a scene that depicts the true nature of Scythe, this strange blend of resource gathering, breezy narrative and workforce management, all against the backdrop of potential mechanized destruction. Scythe is precisely the game I so dearly hoped it would be. Easy to play, so very difficult to win and mastering the game at two players feels a vastly different experience to mastering it at five. It may incorporate familiar elements, yet is never feels derivative. And that balance, just enough to make each faction feel unique and desirable. 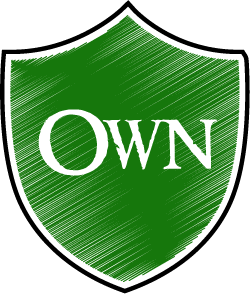 Perhaps most importantly, that combination of switching focus between the solitaire-like element of managing your faction board and engaging your opponents and that exquisitely conceived world on the board, is a platform sturdy enough to hold the weight of what I do not doubt will be many sessions to come. Hype – it does no one favours and only leads to risky satisfaction or (mostly) crushing disappointment. You can’t stop hype anymore than you can stop the tides though. Great review for an awesome game.